This factsheet has been developed to support the implementation of the Natural Resources Conservation Service (NRCS) Feed Management 592 Practice Standard. 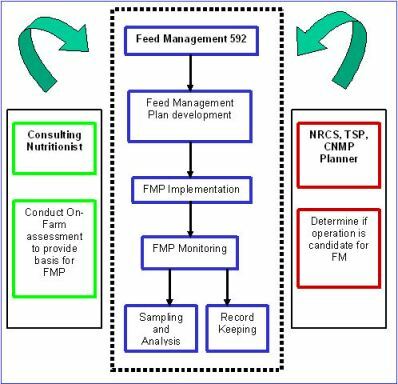 The Feed Management 592 Practice Standard was adopted by NRCS in 2003 as another tool to assist with addressing resource concerns on livestock and poultry operations. Feed management can assist with reducing the import of nutrients to the farm and reduce the excretion of nutrients in manure. Why Is Feed Management Important? Feed represents the largest import of nutrients to the farm, followed by commercial fertilizer CAST Issue Paper # 21 – Animal Diet Modification to Decrease the Potential for Nitrogen and Phosphorus Pollution. Feed management practices impact the amount of nutrients that are imported to the farm and excreted in manure. The excreted nutrients are subsequently available for volatile loss (nitrogen) to the atmosphere and are potentially lost via surface runoff (nitrogen and phosphorus) or leached to groundwater (nitrogen and phosphorus). Feed management opportunities currently exist to reduce imports of nutrients (particularly nitrogen and phosphorus) to most animal livestock and poultry operations. Because consulting nutritionists play such a key role with regard to importation of nutrients to the farm, a systematic approach to evaluate the role that feed management has on whole-farm nutrient management is warranted. What Is the NRCS Standard 592? The ultimate goal of utilizing the Feed Management Practice Standard 592 is to develop a farm-specific Feed Management Plan, or FMP. A five-step process has been adopted for the development and implementation of a FMP. A complete copy of the national version of NRCS Feed Management 592 Practice Standard can be found at the end of this publication. Please check your state-specific version of the standard. Society demands animal agriculture to be environmentally responsible. Many farms are in a positive import-export balance for nitrogen and phosphorus, even when losses of nitrogen are considered. Feed is the primary import of nutrients on most livestock and poultry farms. Adopting feed management practices is proactive toward becoming sustainable. Feed management is an additional practice that can assist in the mitigation of nutrient buildup. There is an ethical obligation for nutritionists to consider a systematic feed management program to reduce import of nutrients to the farm. Agriculture should get credit for practices already implemented. Adoption of NRCS feed management is an option, not mandated. Adopting Feed Management 592 can likely increase profitability. Adopting Feed Management 592 can result in incentive payments to the producer and consultant. Adopting Feed Management 592 provides a nutritionist the opportunity to increase his or her suite of services to producers. Managing the quantity of available nutrients fed to livestock and poultry for their intended purpose. Standards outlined in the most current recommendations of the National Research Council (NRC). Recommendations of the land-grant university. Standards developed by the professional nutritionists of livestock and poultry production companies, feed companies, and/or feed suppliers. Laboratory analysis shall be done on the formulated diet or on the feed ingredients used to formulate the diet, to determine its nutrient content. Feed analyses by laboratories whose tests are accepted by the land-grant university in the state in which the feeding strategy will be implemented. Data from analyzed feed ingredients and/or appropriate historic feed analysis. information for the operation will be used for adjustments of ration formulation. Diets and feed management strategies developed by professional animal scientists, independent professional nutritionists, or other comparably qualified individuals. When required by state policy or regulation, animal nutritionists shall be certified through any certification program recognized within the state. Diets shall be formulated to provide the quantities and correct relative ratios of available nutrients required by the animal species to meet species goals for which the plan is being developed. Adjustments to nutrient levels shall be provided to meet specific genetic potential, environmental demands, and/or requirements to insure health, well-being and productivity. When analysis of manure is done to determine manure nutrient content, the analysis shall be performed by laboratories whose results are accepted by the land-grant university in the state in which the feeding strategy was implemented. Consider nutrient requirements for production based upon stage of growth, intended purpose of the animal, and the type of production (e.g., meat, milk, eggs) involved. Use management practices described in the NRCS Nutrient Management (Feed Management) Technical Notes for the specific animal species. Analyze the drinking water consumed by the animals to determine its nutrient content, and adjusting the diet to account for this source of nutrients. Different feed ingredients (e.g. by- products) and their potential impacts on the nutrient content of excreted manure. The potential impact of feed management on the volume of manure excreted and on manure storage requirements. The impact of feed management practices, animal management practices, and diet manipulation on manure odors, pathogens, animal health and well-being. Using concentrates and forages grown on the farm to minimize the quantity of nutrients imported to the farm, and to maximize the recycling of nutrients on the farm. Analyzing excreted manure or manure from storage facilities to determine manure nutrient content and to estimate the impact of the feeding strategy. Identification of the qualified feed management specialist who developed the plan. Routine feed analysis to document the rates at which nitrogen and phosphorus were actually fed; when actual rates fed differ from or exceed the planned rates, records will indicate the reasons for the differences. Dates of review and person performing the review and any recommendations that resulted from the review. Records of plan implementation shall be maintained for five year, or for a period longer than five years if required by other federal, state, or local ordinances, program, or contract requirements. This Feed Management Education Project was funded by the USDA NRCS CIG program. Additional information can be found at Feed Management Publications. This project is affiliated with the Livestock and Poultry Environmental Learning Center. Detailed information about training and certification in feed management can be obtained from Joe Harrison, project leader, jhharrison@wsu.edu, or Becca White, project manager, rawhite@wsu.edu.